Understanding how to go at full steam. Amidst the different options in power station construction, there is one goal at the top of the list: producing energy as quickly as possible. Although the objective is formulated with utmost simplicity, the solutions for getting there are no less challenging. Apart from widely differing geological and topographic conditions, other major challenges include the special stipulations made regarding the concrete and perfectly co-ordinated timing for the different steps and supplier firms. To us, going at full steam means being your partner during every stage (feasibility study, planning, invitation to bid, execution, ...) of a structure. Because from this point on, it's all about cost efficiency and having a leg up on your own competitor. Our comprehensive experience and, above all, our practical experience in power station construction makes us a partner that's always at your side: from optimisation of the method and schedule of construction through to the synergies in formwork utilisation and on-site support from our specialists. Our formwork systems and concrete monitoring tools ensure the right geometry, quality of execution and construction time. As the world's seventh-largest hydropower project under construction the Dam of Wudongde hydropower station is the world's thinnest double curvature arch dam among dams with height of approximately 300m. RWE Power AG is building a new power station at Eemshaven in the Netherlands, to give it sufficient baseload capacity of its own in the Dutch power-generation market. 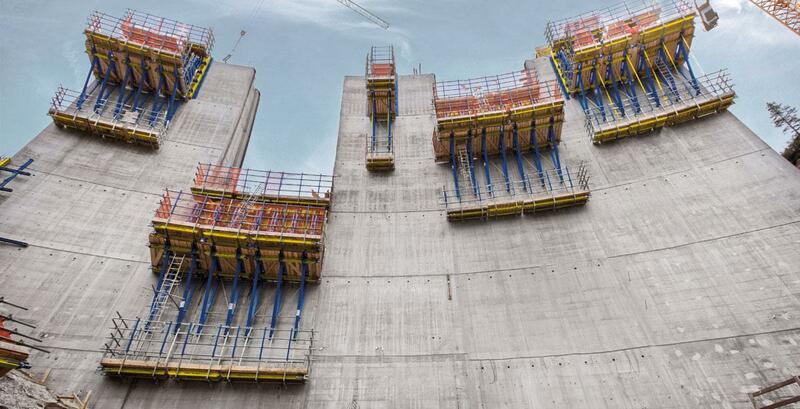 Doka Canada is proud to have been selected as the formwork supplier for the Muskrat Falls Project in Newfoundland & Labrador, Canada. By using the 'Doka wind-turbine formwork', construction firm Skanska was able to shorten the cycle time to just one day, and so come in ahead of schedule. Wide-ranging services from Doka enabled work to get off to a quick start on two reinforced-concrete tanks in Texas, and later made for very efficient formwork operations. The only one of its kind anywhere in the world, a unique solar power station with planned output of 1.5 megawatts went on-grid in Jülich (near Aachen, Germany) at the end of 2008. Ptolemaida - On site at one of the biggest projects in Greece in recent years, construction of the lignite-fired power plant Ptolemais Block V needs cooling-tower formwork expertise from Doka. The Keeyask Generating Station in Manitoba, Canada will be a 695-megawatt hydroelectric generating station providing clean, renewable energy. An average of 4,400 gigawatt hours of electricity each year will be supplied to both Canada and to the United States. The international experience of Doka gives you pooled, concentrated knowledge for a successful project. Your contact person will help you find the best individual solution, to make your project's 'bottom line' a success, too. In short: expert specialised formwork planning with lasting benefits for your power-station construction project. Thank you for your interest - Power station construction. Thank you very much for your interest - Power station construction.